Is this what it’s like to root for the Spurs? Is it really this easy to be a satisfied sports fan? Was it seriously as simple rooting for the Ghosts of Gervin’s Past? Is a dude nicknamed the Big Fundamental really the cornerstone of the most exciting team in basketball? And since when is consistency exciting? Isn’t it like rooting for evergreen trees to keep their leaves? Or cheering for rain during monsoon season or keeping your fingers crossed that Spike Lee will show up in public dressed like a Knicks-sponsored Travelocity Gnome? Nope. Not last night. In Game 1, consistency was thrilling. Consistency barely allowed me to stay seated. Consistency made my contact lens fall out my eye three times because I kept forgetting to blink. And consistency came out on top in a highly entertaining opener to the 2013 NBA Finals, and one that featured a patented LeBron James triple-double. This all made me wonder: Has consistency always been this exciting? Since 1997-98 (Tim Duncan’s rookie season), the Spurs winning percentage hasn’t dipped below .610. In that same time period, they’ve won 50 games more times (15) than the NHL has played full seasons (14). Their plus-.600 streak has spanned three two-term Presidency’s, two wars, a thing called PSY, something else called Soulja Boi and two Kim Kardashian marriages. When it started, Jay-Z was still chilling with Foxy Brown and Beyonce had just released her biggest song to date, one called “No, No, No,” and Blue and Ivy were still just colors and/or rare substances/emotions. Y2K was scary but the Spurs were good, and the Spurs are still good. I just never had the chance to be on their side of things1. But — as has been documented on this site, various social media outlets, in any notebook I own and in a weird picture I drew when I was 11 that has Jeff Van Gundy holding on to Alonzo Mourning’s foot while Derek Jeter was coming in from stage right holding a spiked baseball bat — I’m not really a Heat guy. Never have been, never will be. I haven’t tried what they’re shilling, but hey, somethings you just know you won’t like, you know2? And until now, the Spurs haven’t been a menu item I was interested in trying. Now they’re like the lone burger on a menu in a land-locked fish restaurant: I’ve been cornered into my decision. But beef happens to be what they do in the Midwest And let me tell you, this is a damn good burger. 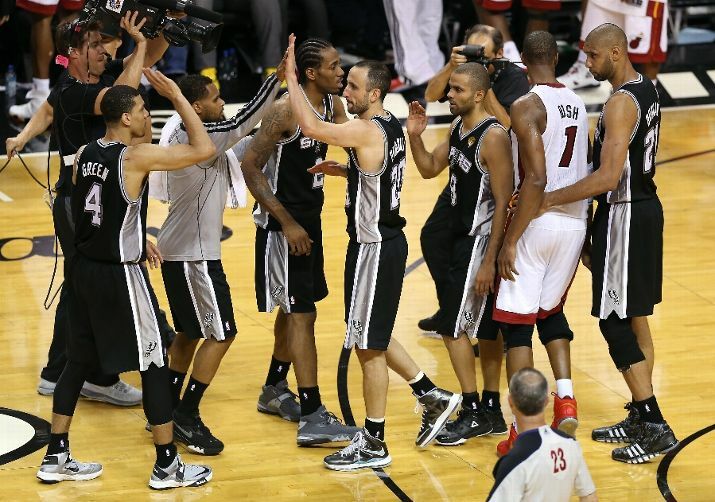 The Spurs are the most professional basketball team I have ever watched. Watching them and comparing them anyone else besides the Heat is like watching the scene in Rounders when Ed Norton’s Worm catches a hanger after Matt Damon’s Mike McD is up big on his own. See, the Spurs would never catch a hanger because they don’t ever force their hand. They’re good enough straight up to leave incessant three-point hucking, panic fouls and other pressing behavior out of their repertoire. 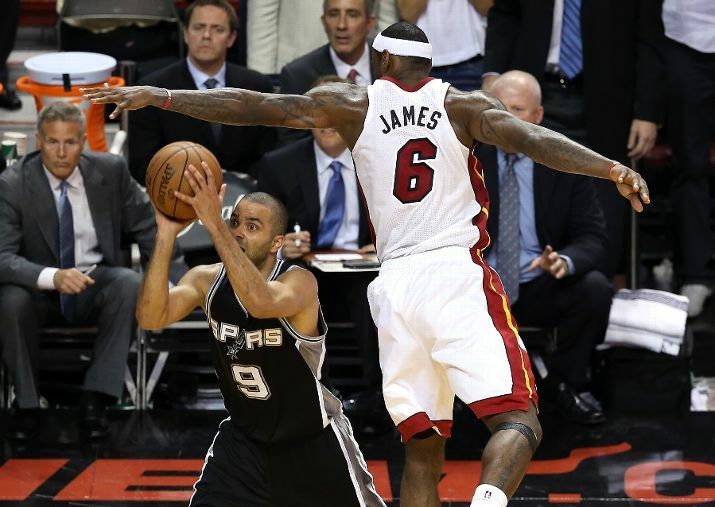 Tony Parker commands the offense with the force of a sergeant but the delicate touch of a string-section conductor. He defers to Tim Duncan — who seems to have exactly two in-game facial expressions, stoic and mime — when its time to and is totally fearless. Like that time he went right at LeBron in the post, or the other time he took it right at Joel Anthony, a guy who is literally in there only because he is tall and can protect the rim. The ancillary parts are fantastic. They have a Danny Green character who is amazing. Here is a related theory: Danny Green is the scariest player in the NBA. I need evidence to disprove this soon, otherwise it’s ironclad. He has one of the smoothest, quickest, yet athletic jump shots in basketball, and seems to like getting dirty. All he does is make open shots, and all he doesn’t do is miss shots he is supposed to make3. But that is something the Spurs whole roster seems to do well; they make their open shots. Whether it’s Gary Neal or Tiago Splitter or Matt Bonner or Green or whoever, if they’re open, they make the shot, a skill I’ve always assumed professional basketball players were supposed to possess. And it feels like there is no such thing as a Spur missing a shot because he was “too open.” Head coach Greg Popovich would filet their innards like the Chesapeake Ripper. Popovich’s “Wired” segments are incredible. He holds meetings, not lectures, and tells his players what to do instead of guiding them in the right direction. When he talks during huddles, there isn’t a bunch of, “Hey guys, we’re playing hard out there…” With Pop, it seems like the whole “playing hard” thing is a given. Which is refreshing considering his underlings are still all members of the richest union (per-member) in the world. But the thing that was perhaps the most fun about watching the hum-drum Spurs was how everyone on their team does not just one thing well, but two. Or three. Kawhi Leonard is a great, long defender. Oh, he also is a very good offensive rebounder and can hit the corner three. 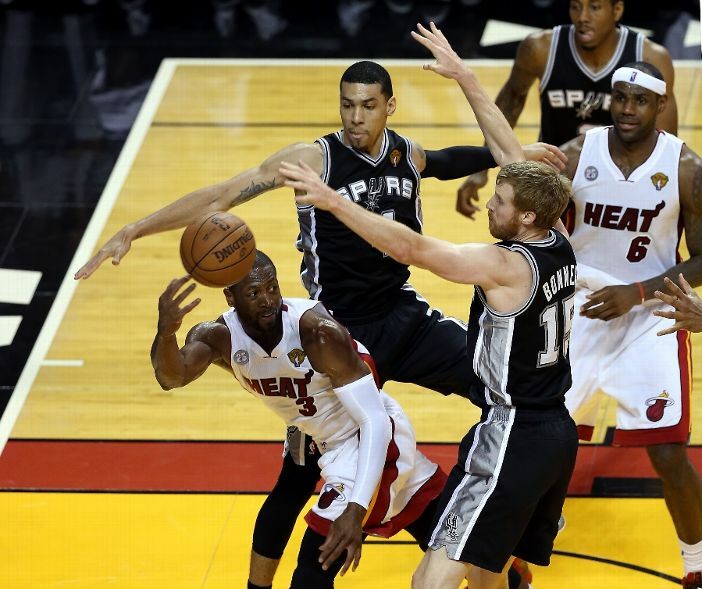 Tiago Splitter defends, finishes and passes. They are professionals in the Wild West of the NBA. Even their uniforms are chromatically similar to a tuxedo. Their lone cowboy, their Doc Holliday of sorts, is Manu Ginobli (who might have taken the Spurs only ill-advised shot during the entire fourth quarter when he hoisted a long three early in the shot clock late in the game with the lead), but Ginobli, his tricky work at the rim and his ever-expanding bald spot are a fantastic Doc Holliday to have4. So while the rest of the world wants to dissect whether or not the absence of a Dec. 21, 2012 apocalypse was also LeBron James’ fault, in addition to the Game 1 loss, I’m just going to enjoy being on the right side of the Spurs wrath for the moment. And enjoy their professionalism. Their first title came in 1999, against the Knicks, so my rooting interests were geologically hampered. Their second title came against the Nets, a series I had no interest in whatsoever due to the fact that 15-year-old me was resentful, the Nets weren’t the Knicks and the Spurs had just ruined my childhood four years earlier. Their third came against the then-defending champion Detroit Pistons, who I liked far more than the evil Spurs. And the fourth title came against Young LeBron, who much like Young Aniken Skywalker, was impossible not to cheer/run through your living room screaming about. Jump. I’m not a judge-y person I am a judge-y person and the mere existence of Voshon Lenard during my tween years couldn’t have helped things. And the fact that Shane Battier grabbed his annoying torch before the thing even hit the ground hasn’t helped matters. Wait The Decision? What was that? Jump. Did I just jinx Danny Green? I might have just jinxed Danny Green. Sorry Danny! What up Long Island! Jump. The Knicks, similarly, are composed of lots of professionals, but some are more like the board members who are so old that they fall asleep during the second slide of a powerpoint presentation. And their cowboy, JR Smith, is more like the Lone Ranger than Doc. JR just likes to blow stuff up. Jump.